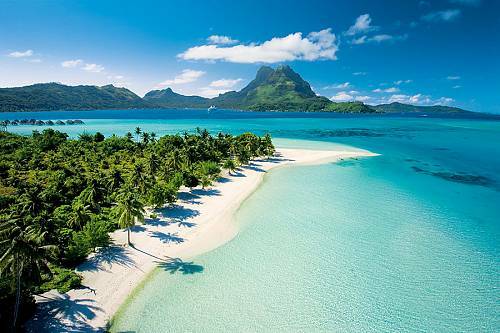 Closest to the international airport at Papeete, the Society Islands are the most popular destinations in the country. Most trips to French Polynesia go here and nowhere else. Tahiti, Moorea, Bora Bora, Raiatea, Taha’a and Huahine offer an awesome array of delicious luxury and stunning natural beauty. Come here to relax and lose touch with the rest of the busy planet. For most, Tahiti is a jumping off point. But for those who stick around, there’s plenty to do. Head out on the circle island tour for 70 miles of coastal cliffs, hidden beaches, and high waterfalls. Stop at a remote seaside church. Or head to the capital city, Papeete, for a visit to one of its local markets. In season, you can even go on a whale watching cruise. Welcome to a diving and snorkeling paradise. Warm calm waters wash over a vibrant reef. Spot sharks on nearly every dive. Hear dolphins clicking as they swim by. On land, visit some of the friendly local villages. Or ride a 4×4 to a hidden swimming hole in a backcountry river. The closest island to Tahiti, in season you can watch whales on a specialized cruise. Island paradise perfection. Romantics travel the world to see its blue/green lagoon and white sand beaches tucked just-so under the dramatic Mt. Otemanu. This is the most popular destination for over-water bungalows. Pick one with butler service, a plunge pool or even a trampoline to launch yourself high in the air before dropping playfully into the tranquil turquoise sea. The second largest island in the country, Raiatea is the religious heart of the ancient South Pacific. The island once launched Polynesian voyages to colonize distant lands (like New Zealand). Now it’s the home to the some of the best preserved stone temple ‘maraes,’ or meeting houses. Accessible only by boat, this beautiful island produces 80% of all the vanilla in French Polynesia. Its lagoon features many deep bays dotted with deserted motus perfect for romantic picnics. There are very few places to stay here and they are all spectacularly relaxing. Made up of two islands and one massive lagoon, Huahine is a tropical garden of Eden. Huahine offers more of an authentic Polynesian experience. It’s home to the one of the best arrays of pre-European stone temple ‘maraes,’ or meeting houses. On the quiet roads, you’ll note a newer tradition– what looks to be over-long newspaper delivery boxes. They are instead where the locals deliver fresh French baguettes twice a day.